Are you Mystified by the Modes? I have a theory (not a music theory in this case, ha) which is that some are eyeing the modes with suspicion because they have such complicated sounding names. As always, I aim to simplify things and point out the deliciousness of the musical topic at hand. Modes, dear lowenders, are really beautiful. 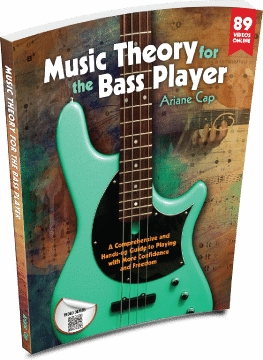 A must know for the bassist, and really, not hard at all! Have you heard that ionian starts on the first scale degree, dorian on the second, phrygian on the third etc? Okay, this is true yet only partly helpful. Because: if I hear C ionian played, and right after that, D dorian – my ears still have that strong C note in their mind (which we had just established as the tonic ) – so it is really hard to hear the beautifully romantic and somewhat cheery, yet potentially sad sounding dorian. Start all of them from the same root! How to figure them out? Ah!!! So, okay, if you are well versed with music theory, that process is automatic. But if not: too cumbersome! know the major scale really well. Know the natural minor scale really well. Play these two in all sorts of keys. There are three major modes and three minor modes. Each is different by only one note compared to the “regular” major or “regular” minor scale. And then there is locrian (a type of minor, but because it has two exceptions, I put it in its own category). lydian – major with a sharp 4 (a raised fourth scale degree!) – sounds sweet, bright. mixolydian – major with a flat seventh scale degree – sounds bluesy or funky in many contexts. aeolian – regular minor – sounds romantic and longing, somewhat dark. phrygian – minor with a b2 (it starts with a half step!) – sounds Spanish, dramatic, dark. Practice them all from the same root to better hear the difference in sound. Then, take two modes differing in only one note – focus on that note and how it affects the intervallic relationships in the next steps. Hear them back to back. Improvise with them. Record a sustaining chord (looper, digital recorder, computer or use something like iRealPro), then play some lines over it. I find it useful to start with playing the triad and add the surrounding notes. The triad gives you the core sound, surrounding notes give you the extra colors. Practice landing on any of the scale steps and hear how it sounds against the sustained chord. Finally, start using them in songs (that is for a different post) and compose some music with them. Be aware that when you hear modes in this context you really hear their modal potential. If you play modes in a functional harmony context (such as in a II-V-I chord progression) you won’t hear their modal beauty as much, because, functional harmony has a different way of expressing tension and release. So, in the Course Music Theory for the Bass Player, we work our way up from intervals to scales to modes. Then we go through every single mode and practice it with jam tracks and point out its particular beauty. Here is an excerpt – check out a few Phrygian samples! Can you think of songs we could listen to using the Phrygian mode ? I’m I’m hearing Jason Bourne about to go off his pursuer.